Almost 20% of baby boomers will retire in the next 5 years, taking essential knowledge with them and vacating a significant number of leadership roles. With the Millennial generation now making up the majority of the workforce, outnumbering Gen X-ers, they will undoubtedly have to fill the gaps left by those heading into retirement. 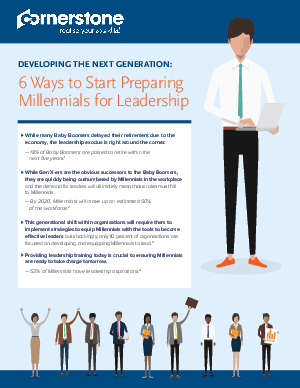 While this might be a startling prospect for some organisations, the best approach is to embrace this shift in personnel and train your Millennials to be the managers and executives you want – and need - them to be.